Churros have been very popular in Spain for a long time. So, you could say that a churro is both a Spanish breakfast and snack, the same as American pancakes, or crepes for the French. But since this delicious easy fried dough recipe spread to the rest of the world, the concept of the original Spanish churro has been distorted a bit, to the point that a Spaniard wouldn’t identify as a churro the many fried doughs sold as churros in the many "churro factory" that are scattered throughout the USA. 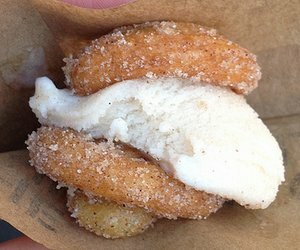 A good example is the famous and delicious churro ice cream sandwich, an American interpretation of churro completely unknown in Spain, which is to create an ice cream sandwich by fitting a piece of ice cream between two donut-shaped churros. 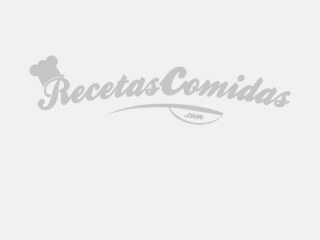 Discover the authentic Spanish churros recipe and prepare in minutes a typical Spanish snack with your friends: churros con chocolate! Heat the water and salt in a saucepan, and wait until it starts to boil. Sift the flour into a large bowl, and pour in the hot water. Stir and mix well until you get the churro dough, which should be sticky and somewhat compact. Place the dough in a churro bag or, failing that, in a pastry bag with a large nozzle, if possible star-shaped. Squeeze the bag and draw a line of raw churros onto parchment paper. Cut into portions. Heat the oil over medium heat, and put the churros into the oil one at a time. Fry until golden brown. Remove each churro one by one and let it sit on absorbent paper roll. At serving time, add a tablespoon of sugar over your homemade churros. 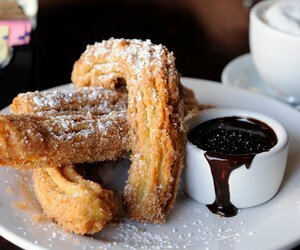 In Spain, the most typical thing is to serve churros con chocolate (hot chocolate), dipping each churro into the chocolate at every bite. Only flour, water and salt? For real? Not that we used an easy churros recipe in this case, because it’s real easy to make churros. The only "difficulty" lies in creating churros with the pastry bag, and frying them. If you have a real churro bag, it’ll be even easier. Although there are many variations in the ingredients of the typical recipe for churros, in Spain it’s said that there are no two identical ways to make churros, so the churros made in Andalusia are real different to those made in Madrid, or in the north of the country. The difference lies in the proportion of flour and water, the type of oil used for frying, the product temperature, and especially in the shape of each churro: stick, hoop, circle, etc. When you know how to make a churro in the traditional way, you may be interested to practice and try them in the oven, especially if you’re someone who prefers to restrict fried food to the minimum. 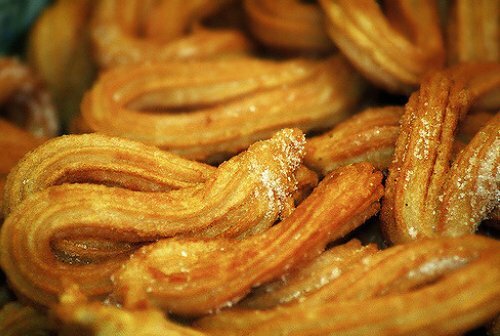 To make baked churros, you should enrich the dough with oil, so that the flavor doesn’t differ much from fried churros. To do this, you can replace ½ cup of water for the same amount of olive oil. Churros are baked at 180°C for about 25 minutes. As you can see in the picture, if you want to develop a churro ice cream sandwich with your churros, the first thing you have to do is get your churros cookie-shaped. To do this, before cooking your fried or baked churros, you have to twist them about themselves to make a circle. Once the churros are made, let them cool before putting a good piece of ice-cream on one of them, and cover with another like a sandwich. There is another alternative, in this case industrial, which involves making churros filled with cream, chocolate, etc. For the dough you can use this same churros recipe, but to make the filling it’s necessary to have a special churro machine. With all this knowledge, if you want to create your own churro factory in your house you have everything: a real Spanish churro recipe, you have the ingredients, you know how to make baked churros, you have all the data to create an original churro ice cream sandwich, and you’ll be especially looking forward to eating churros with chocolate.